It's the $120 billion question everyone will be asking. I pick that number as it's what Apple revenue could conceivably reach during 2011, all with Tim Cook -- and not Steve Jobs -- running the company. Late this afternoon, Apple's board of directors named Cook the company's new chief executive after cofounder Steve Jobs' stunning and unexpected resignation. Cook has quite literally stepped into the most important role in techdom. That's because Apple is literally at the top of the world, and Cook is hugely responsible for the view and often isn't credited enough for bringing Apple there. But, of course, Jobs started the long climb up the mountain, which summit Apple breached under Cook's masterful guidance. In 1996, Apple was near financial collapse. The company's failure to timely release a new operating system and Microsoft's huge Windows 1995 success exacerbated existing structural problems. Then, right near year's end, Apple unexpectedly bought Jobs' NeXT Computer company, bringing back a cofounder ousted during a 1985 boardroom coup. By summer 1997, Jobs had assumed interim CEO status (he also was Pixar's chief executive), obtained a $150-million Microsoft investment as part of an intellectual property settlement and secured a five-year Macintosh Office development commitment. The following year, Apple released the trendy translucent iMac and showed a promising rebound until summer 2000, when the recession smacked most tech companies. Apple shares collapsed. Meanwhile, Apple pushed ahead with investments, with four in 2001 that would be foundational for major products available today. They were, in order of 2001 launch: iTunes, Mac OS X, Apple retail stores and iPod. Still, eight years ago, Apple shares traded in the doldrums. On Jan. 7, 2003, when Merrill Lynch recommend "sell" on Apple, shares traded for $14.85. They closed at $373.60 today, but fell in after-hours trading. Apple's fortunes brightened during the iPod era of the mid-Noughties but big things started happening after iPhone launched in June 2007. 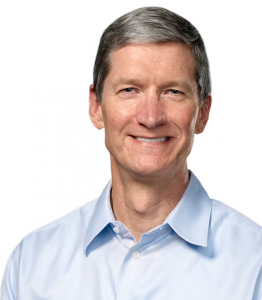 Not coincidentally, Cook, who joined Apple in 1998, assumed the chief operating officer's role in October 2005. His first experience running the company came earlier, when for two months starting in August 2004, he filled in for Jobs. The CEO had cancer, but recovered. In some ways -- and, please, Mac Fanclubbers don't go on a rampage -- Jobs' next two official medical leaves turned out to be good for Apple with Cook running the company. The first leave started in January 2009 for six months and the other two years later and continuing through today. Something overlooked in today's resignation. Jobs asked to remain at Apple as chairman, and the board agreed, but never said he was returning to work. The September 2008 stock market crash devastated Apple. On the 29th, shares closed at $105.26, down $22.98, or 17.92 percent. Shares fell to around $82 in late January 2009, soon after Jobs announced his medical leave. But under Cook's tactful management, Apple sales soared even as other tech companies struggled and the share price with it -- nearing $144 the month Jobs returned. During 2011, with Cook running Apple, revenues reached $53.24 billion compared to $29.2 billion during the same period in 2010, when Jobs was in charge. But Cook's influence goes deeper, as the executive most responsible for managing Apple's supply chain and logistics. Cook is an odd fit for Apple, or at least as it is perceived. He's not a designer or the purveyor of refined tastes that defines Jobs. He's a frienemy turned Mac guy, because Cook comes from the (gasp) DOS/Windows PC world -- and in the worst kind of way by the critical standards set by Mac loyalists (the same people who flame me in comments). "Cook was vice president of Corporate Materials for Compaq and was responsible for procuring and managing all of Compaq’s product inventory. Previous to his work at Compaq, Cook was the chief operating officer of the Reseller Division at Intelligent Electronics. Cook also spent 12 years with IBM, most recently as director of North American Fulfillment where he led manufacturing and distribution functions for IBM’s Personal Computer Company in North and Latin America". He comes from the reseller channel and worked for Apple enemies Compaq and IBM. At Compaq he worked against Apple, particularly. Compaq is the company that successfully copied the IBM PC. The IBM PC launched in mid-1981. About 18 months later, Compaq announced its 12.5 kg clone, nicknamed the "luggable". A year after Compaq started selling its IBM PC clone, Apple announced the Macintosh, in January 1984. Compaq's clone allowed Windows to spread far and wide, and as the man responsible for managing Compaq's product inventory, Cook's work helped Windows PCs to eventually crush Macs. There's an irony perhaps that the skills honed working for Microsoft's partners are now being used against them. I promise you that iPhone and iPad would not be as successful today if not for Cook's success on the supply chain side. The contribution's importance cannot be stated strongly enough. So what's the answer to the question "Who is Tim Cook?" He is the man most responsible for Apple's recent market and financial success. He is a logistics genius, who has made Apple's manufacturing and supply chain one of the world's most efficient. He is the tactician who took risky bets pricing Apple products high, thus preserving margins and establishing a premium brand. He is the person most responsible for the quality of Apple products and the company's uncanny success managing inventories and securing components at hugely favorable prices. But he's not Steve Jobs. Cook is the right alter-ego to Jobs. The new CEO is the pragmatist that brings the vision to market. The question everyone should ask: Who will generate that vision now, since it's so necessary to Apple's corporate culture? Meanwhile, Apple is a machine that can run for years off of iOS products and never release anything truly innovative again. Cook is the right man to run that Apple. But the fruit won't have the same flavor.